Which of these two major consumer discretionary stocks makes the best long-term investment? Disney's stock began struggling about the same time as Mattel's began rebounding in mid-to-late 2015. Data by YCharts. 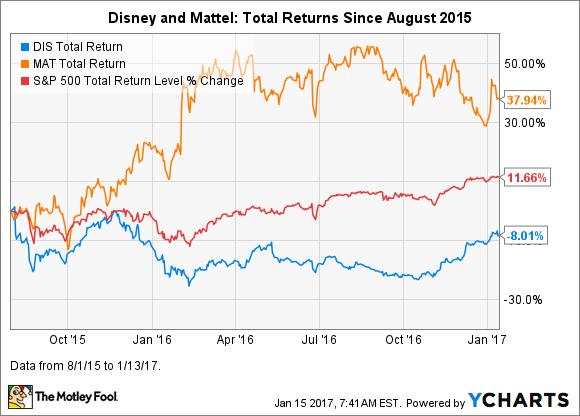 Entertainment titan Walt Disney Co. (NYSE:DIS) and leading toymaker Mattel (NASDAQ:MAT) aren't direct competitors, but they're both major players in the consumer discretionary market. Furthermore, the two have business ties that ebb and flow over time, as Mattel is awarded or loses licenses to produce toys based on Disney's movies and other intellectual property. Disney's stock began struggling nearly a year and a half ago, which is about the same time Mattel's stock began rebounding. The Mouse's stock struggle has been due to the market's concerns that cable cord-cutting is adversely affecting the profitability of the company's cable networks business, particularly cash-cow ESPN. Mattel's stock rebound has largely been driven by rebounding sales of its iconic Barbie doll. On Sept. 7, I wrote an article facing off these two stocks for the first time, declaring that Disney was the better long-term bet at that time. While we're only just over four months in, that call is on track, as Disney's stock has made a big comeback since November, while Mattel's started dropping about the same time. There's been a change of tide in recent months, with Disney's stock jumping and Mattel's declining. Data by YCharts. We now have another quarter of earnings reports behind us, and the stocks have moved in opposite directions -- which in this case means that the valuation of Disney's stock has increased and Mattel's has declined. 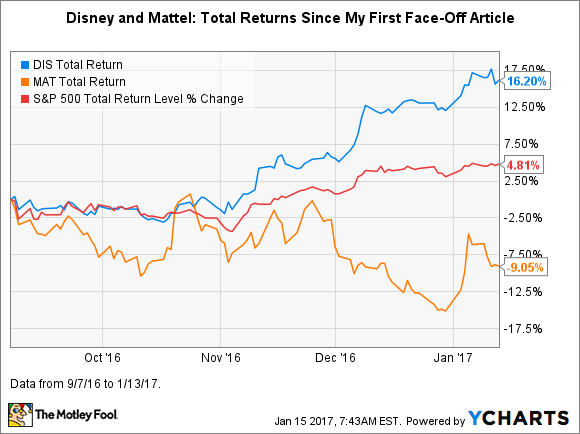 So we're going to take a fresh look at the same question: Which stock -- Disney or Mattel -- looks most attractive as a long-term investment? Data source: YCharts. Market capitalization = stock price x number of shares outstanding; EPS = earnings per share; GAAP = generally accepted accounting principles; YOY = year over year; TTM = trailing 12 month. *S&P 500 total return = 97.1%. Data to Jan. 13. Disney's year-over-year revenue increased 6% over the trailing 12 months, while Mattel's revenue contracted 1.3%. This factor is decidedly in Disney's favor, even though both companies' EPS increased about the same percentage. Over the short term, companies can grow earnings without revenue growing, but this dynamic can't continue over the long term. Three of Disney's four business units (parks and resorts, studio entertainment, and consumer products/interactive media) have been performing well -- particularly its studio business, which has been knocking out blockbuster movies. This segment's revenue jumped 28% in fiscal 2016, ended Oct. 1, while its operating income soared 37%. Disney has had challenges related to cable cord-cutting in media networks, its largest business. However, this business held its own in fiscal 2016, with revenue rising 2% and operating income coming in flat with the year-ago period. Disney's management is aggressively positioning the company so that ESPN and its other content will continue to thrive no matter how the consumer TV-viewing market evolves. To be fair, Mattel's revenue declined over the trailing 12 months only because it lost a highly desirable Disney license in 2016 to rival Hasbro -- the license to make and market Disney Princess and Disney Frozen dolls. Revenue from this license accounted for about 8% of Mattel's total revenue in 2015, so the company has done a nice job closing the revenue gap created by the license loss. Nonetheless, this situation illustrates a point in Disney's favor: Mattel has less control over its destiny than does Disney, in my opinion. Despite Disney's better growth dynamics, its stock is more attractively valued from both a trailing and a forward P/E basis. What the forward P/Es tell us is that the market expects Mattel to grow earnings faster than Disney over the near term. Disney's stock is also more attractively valued from a free cash flow basis, as its P/FCF is 21.0, while Mattel's is 27.8. As for FCF, Disney's increased a whopping 27% over the trailing 12 months -- faster than both its GAAP and adjusted EPS increased -- while Mattel's dropped 34.2%, even though it posted rising earnings growth. Investors should place much weight on cash flows -- at least over the long term -- as cash is a more accurate measure of how a business is performing than earnings, which is just an accounting metric. Another factor in Disney's favor is long-term total return (stock price appreciation plus dividends). Over the past 10 years, Disney's stock has returned 250%, while Mattel's has returned nearly 93%. Past returns aren't indicative of future returns; however, strong performance over the long term suggests that a company has sustainable competitive advantages. Mattel is tiny compared with Disney, whose $172 billion market cap is more than 17 times as large as its $10.1 billion. In general, this factor should work in Mattel's favor, as it's easier for smaller companies to grow earnings -- which generally fuel stock prices -- on a percentage basis than it is for larger companies, because they're starting with a smaller base number. For investors concerned with current income, Mattel's stock is the better choice. Its dividend is yielding a juicy 5.2%, versus Disney's 1.4%. However, Disney's dividend has much more room for growth, so investors not overly concerned with current income should take this factor into account. Mattel's cash dividend payout ratio (dividends paid/free cash flow) is 142.6%, which means it paid out nearly 43% more in dividends over the trailing 12 months than it generated in free cash flow. This is not an infinitely sustainable situation. Disney's cash dividend payout ratio is a conservative 27.4%. Disney will be able to overcome challenges related to cord-cutting in its cable business and continue to successfully grow its overall business. Mattel will successfully turn around its business and then continue to grow earnings. I continue to believe that Disney's stock makes the better bet for the long term. This is a company that arguably has the most valuable intellectual property in the entertainment industry. It has successfully navigated numerous changes in the consumer media market over its long history, so there is every reason to believe it will do so again, as more consumers cut the cable cord and consume their TV and other media via streaming services. While CEO Chris Sinclair has been doing a great job turning around Mattel, I'm not comfortable with how important Barbie is to Mattel's overall fortunes. In Q3, this brand accounted for 19.5% of Mattel's total revenue and an even larger percentage of its profits. (We don't know the exact number; we just know that its Barbie brand margin has historically been higher than the company's average margin.) Mattel's declining FCF situation is another reason I favor Disney. Potential investors should know that Disney CEO Bob Iger said on the Q4 earnings call that management expects fiscal 2017 to be a slower growth year but anticipates that the company's robust recent growth dynamics will continue in 2018 and beyond.